Justin Brown’s trio of travel memoirs have been lapped up by readers who want a travel story with a difference. In Bowling Through India the author is joined by a high-country farmer, a businessman, a photographer and a shoestring traveller named Blanket Boy. The amateur sportsmen take to the streets of India to face off against kids who can bat and bowl like demons. Amidst the sledging and inappropriate jokes, the Black Craps, as they name their team, learn about life, love, death, compassion and the fascination of India. 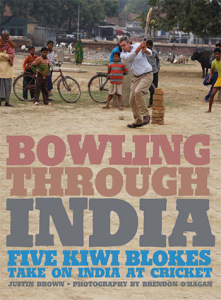 A book about travel, humour, mateship and the love of cricket that unites people whatever their age, race and station, Bowling Through India is an endearing and affecting read. The honours, though, went to two books with that little something extra, elevating them beyond mere storytelling and beyond their competitors. In the end we agreed on Bowling Through India by Justin Brown. It may not be to everyone’s taste. The language is modern, expletive-filled and irreverent. If you can get past that, you will be rewarded with a fresh, humorous and, at times, very touching book. The judges — especially Karen who hates cricket — were surprised at how they were won over, in spite of the sometimes graphic language and imagery. But really the book has little to do with cricket. It’s a much more subtle and moving account of a country and its people than the voice would at first suggest. I think that’s because there’s a healthy layer of self-mockery in the blokey outer layer. It’s clever and original and very, very evocative. It made each of the judges want to visit the places being written about and that’s important. Four of this years’ nine books represented ‘travel-writing’ at its most traditional. Bowling Through India was the best of that group. What defined it was its originality, the quality of the writing and the depth of imagery.